57 Baby Point Cres., Toronto. In the west end of Toronto, a set of stone gates marks the entryway to a quiet enclave known as Baby Point, which hovers above the Humber River on a natural promontory. At one time, the land below was the site of a Seneca village known as Teiaiagon. The village sat at the south end of Carrying Place, which was a major portage for First Nations people and fur traders travelling between Lake Ontario and waterways in the north. Europeans who arrived in the area in the 1700s took control of trade and the land. The name Baby Point comes from the settler James Baby, who led a militia in the War of 1812. As a result of his loyalty to the British Crown, in 1816, he was granted – or allowed to purchase – a large swath of land that became his family farm. The houses that stand in Baby Point today were built mainly in the 1920s and ’30s by the developer Robert Home Smith, who went on to develop the Kingsway on the west side of the Humber River. No. 57 sits near the western end of Baby Point Crescent, where the wooded ravine slopes down to Étienne Brûlé Park. The house has a large circular drive in front and lawns and tall trees surrounding it. The house is surrounded by trees. Behind the Tudor Revival exterior, the interior is a blend of original details and contemporary design. Owner Erin McLaughlin is the editorial director of Style at Home and Canadian Living magazines. For the past few years, Ms. McLaughlin has been renovating the home to make it more comfortable for the couple and their two daughters. Ms. McLaughlin moved from a narrow Victorian rowhouse in the centre of Toronto to the 7,000-square-foot home set on two-thirds of an acre. “To move to a Tudor Revival was a big change for me,” she says. Her goal was to incorporate design that suited her style without completely gutting the building. Visitors who arrive to the front door step into a vestibule with oak-panelled walls, a stone floor and French doors to the foyer. In the foyer, Ms. McLaughlin eschewed the modern trend of painting over the original oak. Two stairs lead to the living room, which has a beamed ceiling and a wood-burning fireplace surrounded by stone. “It feels even more magnificent when you actually step into it,” Ms. McLaughlin says. She put in a nine-foot sofa to ground the space and hung one large framed photograph over the fireplace. Ms. McLaughlin says she prefers a minimal look but she thinks the room would be equally suited to bookcases and Persian carpets. Previous owners added a semi-circular conservatory beside the living room. The onyx floor is heated in winter and the windows open in warm weather. Vistas from the conservatory stretch beyond the valley to the skyline in the distance. “You can hear the river,” says Ms. McLaughlin of the room’s position near the edge of the ravine. The green and brown stone inlay in the conservatory floor is rimmed in brass. Real estate agent Janet Lindsay of Chestnut Park Real Estate Ltd. points out that the green and brown stone inlay in the floor is rimmed in brass. A small study has built-in bookcases and wallpaper in deep charcoal. During the renovation, Ms. McLaughlin found documents from the year the house was built that had been trapped behind the original bookcases. Now they hang on the wall in the study. The formal dining room has a ceiling with elegant plaster detailing and a bay window overlooking the garden. “The ceiling is what made me buy the house,” Ms. McLaughlin says. The rear addition was built by the previous owners. A swing door leads to the new kitchen and casual dining area, which Ms. McLaughlin transformed inside a rear addition built by previous owners. Today, the kitchen has high-gloss cabinets in white and dove grey and a marble waterfall countertop on the large island. Appliances include a professional-style gas range and griddle, a wine fridge and a built-in espresso machine. 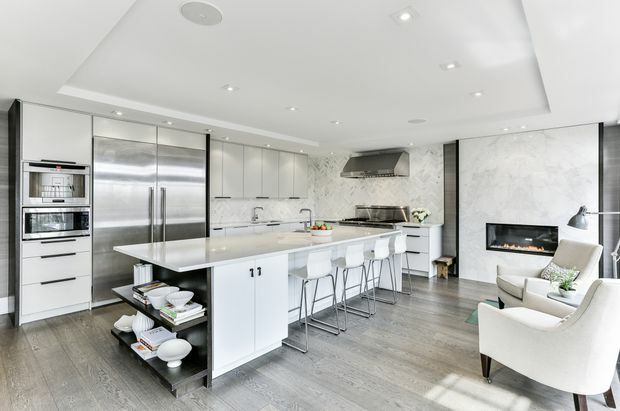 There’s a gas fireplace set in floor-to-ceiling white marble and a wall of windows and doors leading to an outdoor terrace. Ms. McLaughlin says the white walls and surfaces in the kitchen maximize the light. Throughout the house, she juxtaposed white with charcoal and wood floors in smokey tones. McLaughlin says the white walls and surfaces in the kitchen maximize the light. Upstairs, a family room has a cathedral ceiling 16 feet high. Two south-facing windows overlook the gardens and two skylights have automated shades. Ms. McLaughlin says the room – recently redesigned to be more light and airy – is the new go-to place for the family to gather. “It has a much more Scandinavian vibe,” she says. Two bedrooms on that floor have ensuite bathrooms and there is a family bath as well. Down the hall, the master suite has a large bedroom, dressing room, ensuite bathroom and his-and-hers walk-in closets. Stairs lead to the third floor, which has a bedroom with skylights and a bathroom with a walk-in shower. Ms. McLaughlin points out that the light-filled space would also make a secluded home office or studio. The third-floor bedroom is a 'flexible space' that could also work as a home office or studio, McLaughlin says. On the lower level, a large room with an indoor pool is temperature-controlled year-round. Doors open to the stone patio outside. The lower level also has his-and-hers change rooms for the pool, and a recreation room with a bar and kitchenette. Ms. McLaughlin had cabinets custom-built to hold a collection of vinyl LPs. Ms. McLaughlin says the Baby Point area feels removed from the rush of the city but she can be downtown in 20 minutes. The lower level has his-and-hers change rooms for people who want to take a dip in the temperature-controlled pool. Hummingbirds, northern cardinals and butterflies visit the garden, and hawks circle above the river valley. Ms. McLaughlin has seen a small group of deer run across the front lawn and into the ravine. In the centre of the community, the Baby Point Club has outdoor tennis courts. Fitness classes and social events are held in the vintage clubhouse. “I don’t think I’ve ever felt a sense of community like I feel here but you still have your privacy,” she says. The master bedroom suite has a vaulted ceiling. The master bedroom suite has a vaulted ceiling in the large bedroom and sitting area overlooking the ravine. A door opens to a private balcony overlooking the garden. There are his-and-hers walk-in closets and a gallery for art and family photos. The bathroom was recently renovated with a marble-topped vanity, heated marble floors and a walk-in glass shower with a quartz bench. The stand-alone tub beside the window is weighty cast iron.